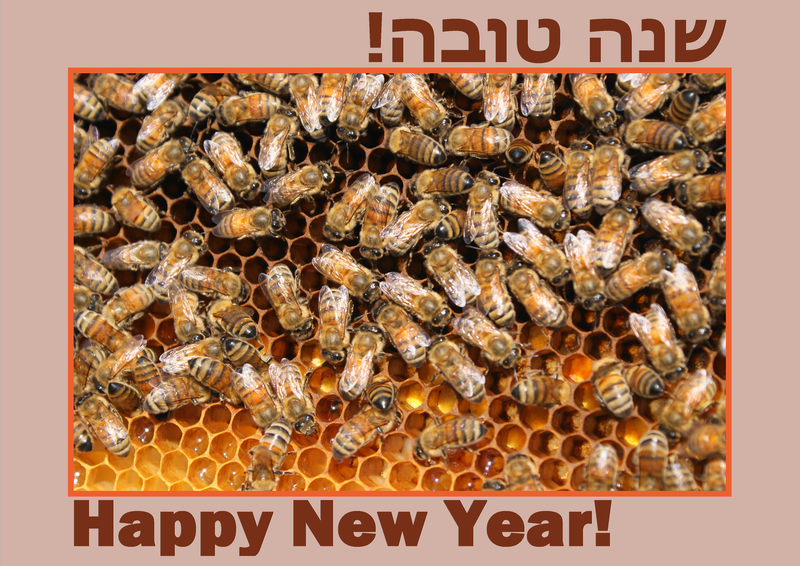 Wishing all our readers celebrating Rosh HaShana a happy, healthy, peaceful and sweet New Year. 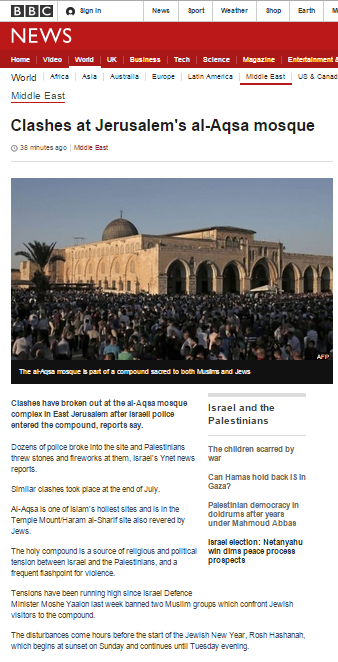 Readers no doubt recall that a couple of months ago the BBC produced some unsatisfactory reporting (see related articles below) on the topic of violent riots on Temple Mount which were instigated in order to disturb visitors to the site on Tisha B’Av. 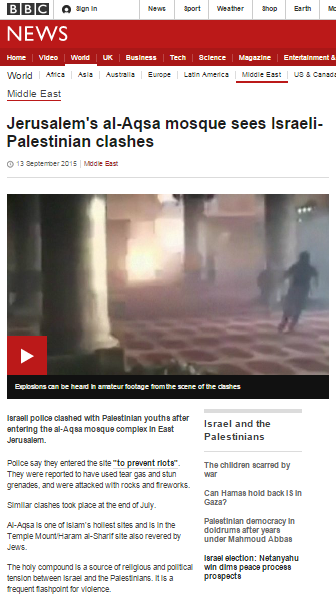 On the eve of Rosh HaShana (New Year), a similar incident took place at the same site and the BBC’s reporting showed little improvement. 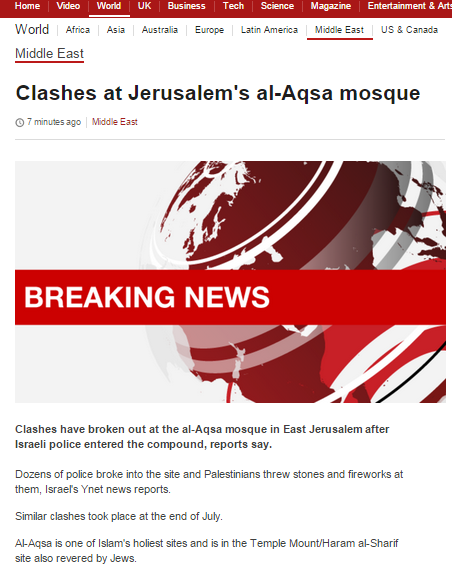 The BBC News website published an article on its Middle East page on September 13th which was originally headlined “Clashes at Jerusalem’s al-Aqsa mosque” and currently goes under the title “Jerusalem’s al-Aqsa mosque sees Israeli-Palestinian clashes“. “During the night pipe bombs were seized in an apartment in east Jerusalem in a joint operation by the central [police] unit of the Jerusalem district and the Israel Security Agency. In addition, intelligence was received concerning masked individuals who barricaded themselves inside Al Aqsa Mosque during the night. The police force […] surprised the barricaders and entered the Temple Mount area this morning with the aim of enabling the commencement of visits to the site. Immediately with the entry of the forces the rioters ran away into the mosque and began throwing stones and [concrete] blocks at the policemen as well as firing fireworks directly at them. During the operation pipes suspected as being pipe bombs were seized and removed from the site by a police bomb disposal expert. In other words, this was yet another attempt (continuing, by the way for the third consecutive day at the time of writing) by violent rioters to disturb visits to Temple Mount on a Jewish holiday. So how did the BBC describe the incident? The article has undergone numerous changes (viewable here) since its initial publication. Early versions clearly suggested to readers that the violence was the result of the entry of the police into the compound, with no mention made of the intentions of the rioters and their prior organisation of pipe bombs and other objects intended to be used as weapons. “Tensions have been running high in the city since Israel Defence Minister Moshe Yaalon last week banned two Muslim groups which confront Jewish visitors to the compound. As has been noted here on numerous occasions, the BBC has consistently failed to report on the topic of the salaried agitators who harass non-Muslim visitors (not just Jewish ones, as claimed in this report) to Temple Mount. It is therefore highly unlikely that readers of that sentence would understand how those “Muslim groups” – the Murabitat and Murabitun – disturb public order or why they were recently outlawed. All versions of the article fail to clarify to readers that Temple Mount is the holiest site in Judaism. Only in the third version of the report did BBC audiences begin to get any inkling of the background to the story. Only in the fifth version of the report were audiences made aware (by means of second-hand quotes) of the context of the intention to disturb visits to the site. “Police were quoted in the Israeli media as saying the Palestinian youths who had barricaded themselves into the mosque were planning disruption to prevent Jews visiting the site. Security forces launched a surprise raid at around 06:45 (03:45 GMT) in the hope of opening the site as planned, Haaretz newspaper reports. Of course those who read the report’s earlier versions were deprived of that context seeing as visitors to the BBC News website have no way of knowing that an article they have already read has been updated. From version six of the article onwards it was deemed appropriate to give unqualified amplification to a statement which clearly detracts from audience understanding of this story rather than contributing to it. The real story here is the continued attempts by Palestinian agitators to disturb visits to a site of significance for members of three religions – particularly at the time of Jewish holidays. In this particular incident the storage of pipe bombs at a holy site clearly represents a serious escalation which is not adequately clarified to audiences in the BBC’s report. Notably too, the BBC passed up on the opportunity to correct its previous long-standing omission by beginning to report on the organised groups which hassle non-Muslim visitors to Temple Mount and the funding behind them. This story was also the subject of a radio report which will be discussed in a future post. Has the BBC discovered 50,000 previously unknown Jews in Iran? 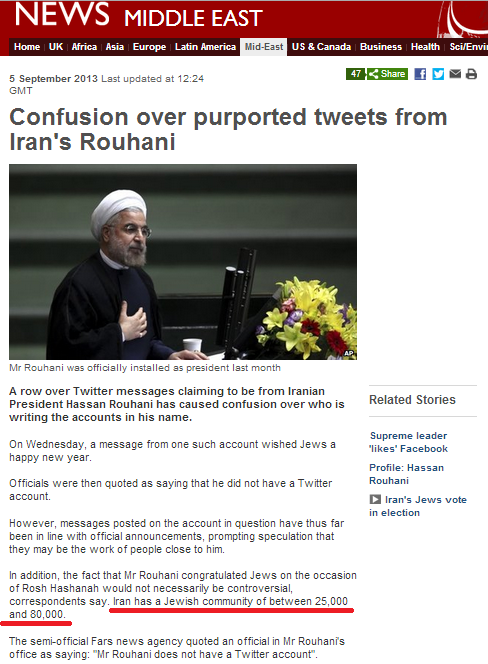 An article appearing on the Middle East page of the BBC News website on September 5th reports on “Confusion over purported tweets from Iran’s Rouhani“. The Tweet in question is this one below and, as readers have no doubt already heard, one of Rouhani’s advisers has already denied that it was sent by the Iranian president himself. But no less interesting than the story itself is the fact that the BBC appears to have discovered (or invented) at least fifty thousand previously unknown Iranian Jews. 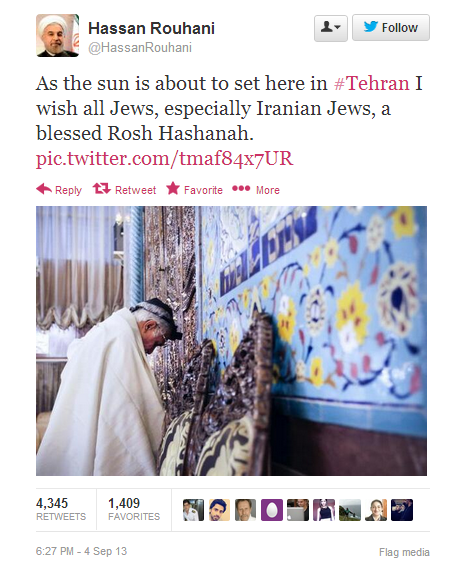 The 2011 Iranian government census cited a population of fewer than nine thousand Jews in Iran. Ha’aretz and CNN both put the number of Iranian Jews at around ten thousand whilst the National Geographic cites an upper estimate of 25,000. According to the Tehran Jewish Committee and the US State Department there are up to 30,000 Jews in Iran and in 2006 the BBC itself cited a figure of twenty-five thousand. 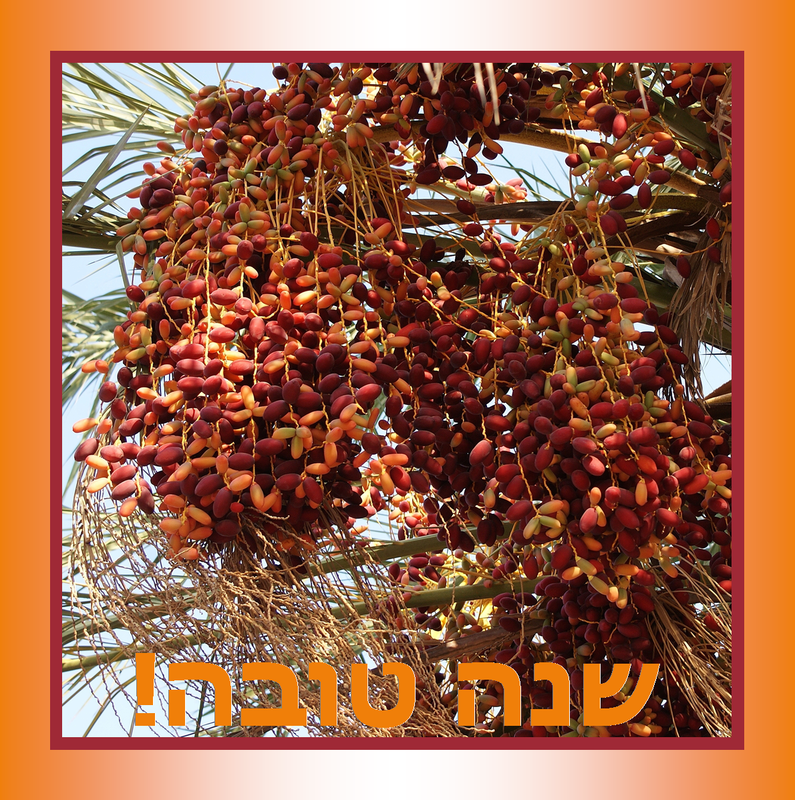 Whilst the size of the contemporary Jewish community in Iran is notoriously difficult to quantify due to the reluctance of some (for obvious reasons) to identify themselves as Jewish, even the most generous estimates do not top thirty thousand: 50,000 fewer than the upper number cited in this article. If the BBC has factual evidence to support the claim of a Jewish population in Iran numbering 80,000 – a figure over 71,000 above the number given in the official census and interestingly identical to the numbers known at the time of the Islamic revolution in 1979 – that certainly would be news. 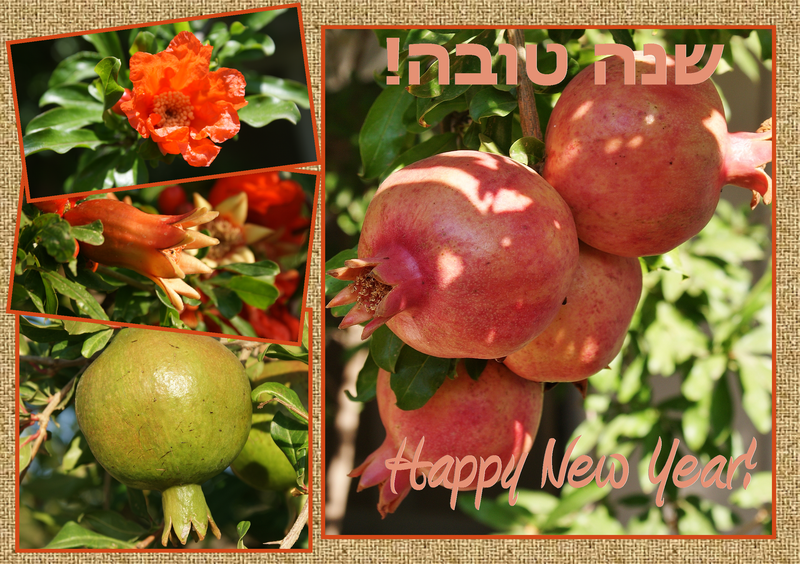 Wishing all of our readers celebrating Rosh HaShana a happy, healthy and peaceful New Year.